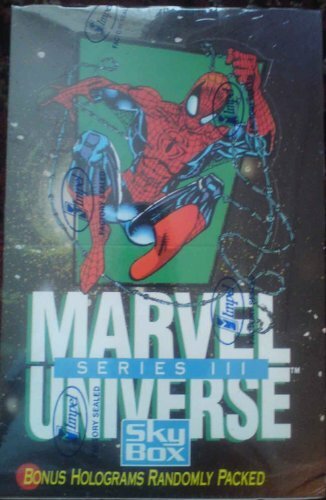 A brand new 162 card base set of 1991 Impel Marvel Universe Series II trading cards already transferred to and protected by Ultra-Pro Platinum archival-quality collector pages for easy viewing. 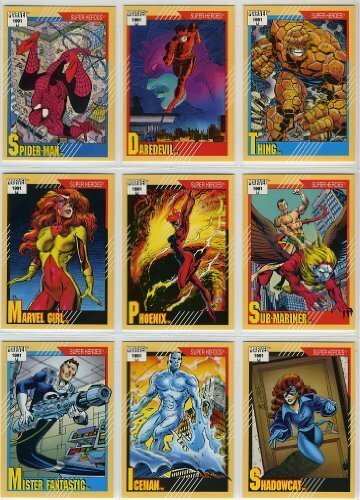 The cards feature images of all of the Super Heroes, Super-Villains, Arch-Enemies, Weapons, Legends, Rookies, and Teams in the Marvel Universe created by Stan Lee. The reverse side provides a profile of each character and introduced Power Ratings where character attributes such as Speed, Stamina, Intelligence, Strength, Agility, and Durability are rated on a scale of 1 to 7. This is the only series to ever include a Legends tribute to characters that had died and a Weapons category with a statistical look at weaponry. Avengers collectors Set - Cards for collectors and gamers accurately represents the super powers and histories of the marvel characters, and as a Vs. System game. Fully compatible with other BVs. System releases. 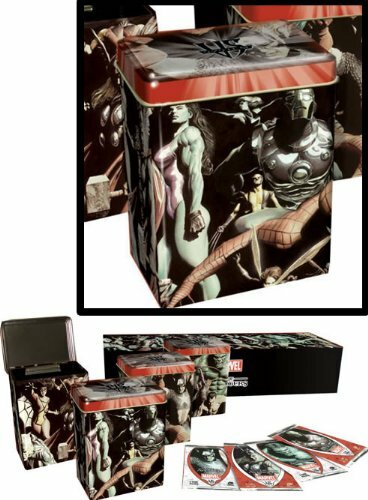 Upper deck special collection in Collector's Tin features Alex Ross Art, 4 special foil cards and 4 booster packs included. This set featured 179 base cards plus the checklist. 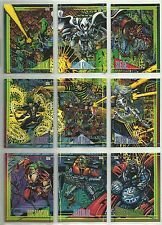 It also had a 9 card red foil chase set featuring characters from the Marvel 2099 comics. This set was noteworthy because 135 of the 180 base set cards were portions of larger 9 card pictures. Thus, when the cards were put into standard 9 card sheets, the cards formed a large, contiguous, image. 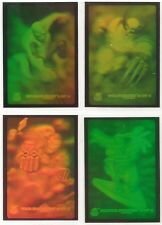 There were also 9 cards of "Unsolved Mysteries" such as Wolverine's origin or the identity of the 6th member of the Infinity Watch. The remaining cards featured famous battles of heroes vs villains and also heroes vs heroes. 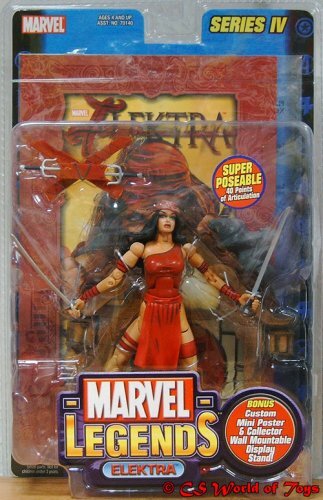 The deadly Elektra is here thanks to the nice folks at Toy Biz. Soon to be starring in her own flick, Elektra is sure to be the hottest of the new Marvel Legends figures in more ways than one! Produced and Distributed by Impel Marketing. Licensed by Marvel Entertainment Groups, Inc. Explode into action with these spinning, smashing whirlwind warriors! 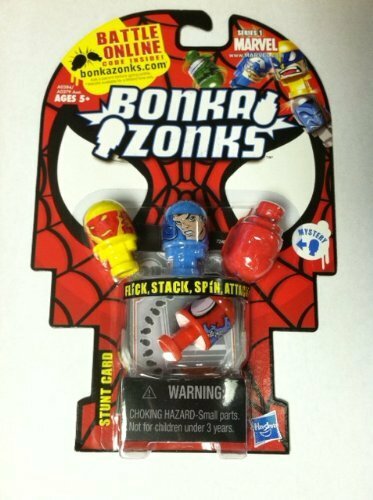 This 4-pack of BONKAZONKS MARVEL spinners includes 3 of your favorite heroes and one mystery spinner. Spin them! Flick them! Stack them! Attack them! Learn a new BONKAZONKS trick from the included stunt card. Your BONKAZONKS fighters are on your team and they play your game, so build an "army" and take on your opponents in the spinning frenzy! It's time to get dizzy with it! 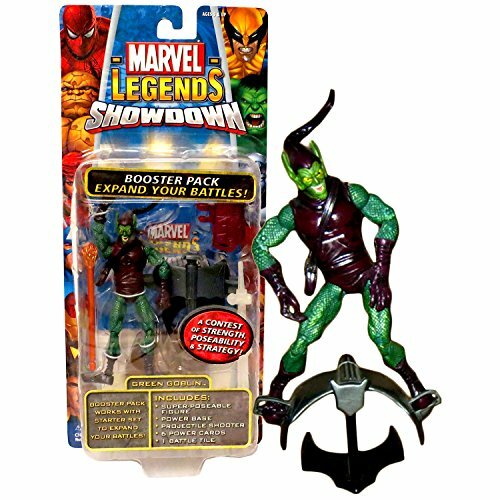 Pack includes 4 assorted figures and stunt card. Ages 5 and up. Famous characters from the Marvel Universe engage in the ultimate action figure battle! Put your hero in the attack pose of your choice, and use unique Battle Tiles, Power Cards, Projectiles and a personal Attack & Defense rating on his base to enact your battles. These powerful elements and your strategy help decide the winner of each battle.